This session didn’t attract a large crowd, but it attracted a good one — with lots of excellent questions. I hope you benefit from learning the answers. The two plugins used in the WordPress for Toastmasters system are RSVPMaker and RSVPMaker for Toastmasters. They are pre-installed on Toastmost.org accounts. The Lectern theme makes it easy to add Toastmasters approved branding. The documentation is at WordPress for Toastmasters (wp4toastmasters.com) and you can go to Toastmost.org to register for a free (ad supported website). Toastmost.org, the free websites piece of the WordPress for Toastmasters project, continues to grow. It took me a while to get Google Analytics set up properly for a network of websites spread across multiple subdomains, but I now have some statistics to share. So 1,660 users (unique visitors) in a month, most of them returning visitors (club members or actively interested prospective members) and 9,000+ pageviews. These are mostly home page views, although farther down the list you see members visiting individual blog posts and event listings. Online clubs are heavily represented because they particularly depend on their websites to recruit members and organize meetings. An online club I founded, Online Presenters, is number 1 on this list (although it isn’t always) and the #10 spot represents a special event we held and aggressively promoted, our mini-webinar contest. The page to sign up for a free account is toastmost.org, which also shows up on the list above. This is a volunteer-led product that depends on sponsorship and advertising to offset web hosting costs. For sponsorship opportunities, contact David F. Carr, DTM, at david@wp4toastmasters.com. The free club website offer from the WordPress for Toastmasters project is back! Fill out the signup form at toastmost.org, and you can be adding content to your website and setting up your online agenda and meeting role signups within minutes. WordPress for Toastmasters is an open source software project that adds Toastmasters-specific branding and functionality to the world’s most popular blogging and web content management platform. 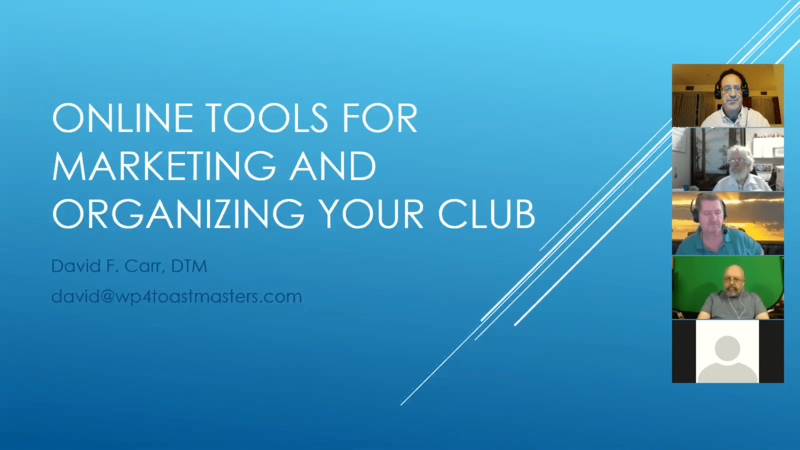 You get access to professional, world-class tools to use in your club marketing and recruiting efforts, combined with the ability to manage club agendas, invite members to sign up for roles, and track member progress through the educational program. This is a volunteer project led by me, David F. Carr, based on software I originally created for my home club, Club Awesome Toastmasters, and decided to share with other Toastmasters club leaders. I continue to seek advertisers and sponsors to underwrite the costs of this project, particularly related to the toastmost.org club website hosting offer. See Support the WordPress for Toastmasters project. The software itself is available for free, but you need a WordPress-powered website to host it on — and not everyone who could make use of the software is enough of a techie to set it up on their own. Toastmost.org simplifies the initial website setup. Creating the web content that shows what makes your club special is still up to you. Running the toastmost.org service does cost money, which is why I briefly switched to a 6-month free trial offer for new sites, with the idea that clubs would pay a subscription fee after that period. However, I am going back to a free offer because I understand free is the only price that makes sense for most clubs. I am currently experimenting with a couple of affiliate advertising programs that may help offset the costs of running the service as it grows. My preference is to secure direct advertiser or sponsor support. If you have a product or service that would be of interest to Toastmasters around the world who use this service, please consider becoming a sponsor. See Support the WordPress for Toastmasters project. The free trial period for WordPress-powered club websites hosted at toastmost.org is now 6 months, rather than 60 days. The idea is to make the trial long enough for a pre-charter club to launch or for an existing club to prove that the site helps them market their club, recruit members, and organize meetings. Clubs can also use the toastmost.org service for their preliminary testing, even if they ultimately decide to host with another service that supports WordPress. The WordPress for Toastmasters software suite extends WordPress, a professional web content management platform, by adding Toastmasters-specific features such as agenda management and member progress tracking, as well as site branding that meets Toastmasters International requirements. The software runs on any web hosting service that runs WordPress. The primary author of these software extensions is me, David F. Carr, DTM. I originally created the software for my home club, Club Awesome in Coral Springs, FL, and more recently have been exploring the requirements of online clubs as president of Online Presenters. My company Carr Communications Inc., operates the toastmost.org service. A toastmost.org site will have a web address in the format myclub.toastmost.org. All toastmost.org sites are SSL secured and have the software preconfigured. I can also support hosting an independent site at your own domain. See toastmost.org for details. Competing with “free” is always tough, and I understand that Toastmasters clubs are used to getting a free site on the Free Toast Host service underwritten by Toastmasters International. However, I don’t believe FTH comes close to matching the web publishing and social media marketing tools you get from WordPress. And free WordPress options such as the WordPress.com service do not support the Toastmasters-specific functionality I offer. Keep in mind that the software itself is free and open source, representing countless hours of time invested in making it better not only for my own club but for others who take advantage of it. I’m giving a lot away, just because I want to share it. I originally set out to offer toastmost.org as a free service — with “free” meaning advertiser or sponsor supported. That would still be my preference, except that I haven’t found a sufficiently generous sponsor. Even then, free wouldn’t be free — the server and other resources such as SSL security certificates are not free to me — so they have to be paid for somehow. Still, hosting on toastmost.org is less than you would pay for a reputable WordPress hosting service elsewhere and also simpler (I take care of many technical requirements so you don’t have to). And if you decide to install the software on some other hosting service, I am still available to answer your questions. If you have a product or service that will appeal to Toastmasters, consider advertising on Toastmost.org, a club website hosting service based on the WordPress for Toastmasters project software. The price of advertising for one month has now been cut from $200 to $100, with further price breaks for longer terms. Advertise to Toastmasters leaders in the clubs who take advantage of the free website offer at toastmost.org (example: demo.toastmost.org). Ads appear in the sidebar of the page. WordPress for Toastmasters is a free, open source software project that adds features like agenda management to WordPress, the world’s most popular blogging and web content management platform. Toastmost.org is a hosting service from Carr Communications Inc., the company of project founder and chief programmer David F. Carr, DTM. The software is compatible with any WordPress web hosting service, so the advantage of Toastmost.org is to provide support directly from the author of the Toastmasters-specific software. WordPress for Toastmasters receives no financial or logistical support from Toastmasters International, but the Toastmasters-branded theme Lectern has been reviewed for conformance to Toastmasters branding requirements. Update: As of December 2017, the free trial is now for 6 months. The Toastmost.org Toastmasters club website hosting service is relaunching as a free 60-day 6-month trial offer, after which club leaders must decide whether upgrading to a paid plan makes sense for them. More details at toastmost.org. The hosting service is intended as a convenient way for club leaders who aren’t necessarily techies to set up and configure a site that takes advantage of the WordPress for Toastmasters software. Originally, it was offered as a free service to be supported by ads and donations, but that income stream proved inadequate. Putting the Toastmost.org service on a more solid business plan is important to ensuring servers and services will be upgraded as needed for reliability, performance, and security. If your club signed up for the free club website offer, you will continue to get that same deal. I may try to lure you into a voluntary upgrade, but I will honor the terms you signed up for. I thank you for your feedback on improvements to the WordPress for Toastmasters software, and I’ll keep trying to make it better and easier to use. Going forward, I will work on sharpening the branding distinction between WordPress for Toastmasters, the free open source software project, and Toastmost.org website hosting, a service of my company, Carr Communications Inc., based on that software. As a business venture, I my current ambition for the hosting service is merely to get it to cover its own costs as it grows. If you have one of the free sites, or are hosting a site elsewhere, consider making a donation if you see the value. Meanwhile, the point of the WordPress for Toastmasters project is still to share online marketing and club management tools I originally created for my home club, Club Awesome, recently used when starting Online Presenters, and have shared with a small but growing group of other clubs. You can support the project helping with documentation, design, or programming (depending on your skills) or offering training at a district event. Thank you for your interest in this project and your support for keeping it going.